Cal Thomas, Larry Kudlow, Mark Levin and Ann Coulter highlighted the MRC’s "2008 DisHonors Awards: Roasting the Most Outrageously Biased Liberal Reporters" presented on Thursday night, April 10, before an audience of more than 1,000 packed into the Independence Ballroom of the Grand Hyatt hotel in Washington, D.C. Following the presentation of the DisHonors Awards videos in five categories (see links to videos below), a look at some "funny clips" from 2007 and the audience picking the "Quote of the Year," MRC President Brent Bozell honored Tony Snow with the MRC's second annual "William F. Buckley Award for Media Excellence." Snow praised the late Buckley’s selfless efforts to identify and encourage promising young conservatives and then Snow regretted the current political rancor as he urged the audience to appreciate America’s greatness. The evening ended on a more somber note, with a video tribute to Navy Lieutenant Michael Murphy, a SEAL who was posthumously awarded the Congressional Medal of Honor for selfless valor in combat in Afghanistan in 2005. MRC Trustee Boone Pickens came on stage afterward to present Murphy’s father, Daniel, and brother, John, with a $1 million check for the Congressional Medal of Honor Foundation and then Daniel Murphy thanked Pickens and expressed gratitude for the 29 years he had with his son. DisHonors Awards winners were selected by a distinguished panel of 15 leading media observers, including Rush Limbaugh, Mark Levin, Laura Ingraham, Tony Blankley, Steve Forbes, Robert Novak, Walter E. Williams and Thomas S. Winter, who served as judges. Cal Thomas, a syndicated columnist and panelist on FNC's Fox News Watch, served as Master of Ceremonies. Larry Kudlow, host of CNBC's Kudlow & Company, presented the first two awards, followed by columnist/commentator Ann Coulter who set up the funny clips and presented the third award. Talk show host Mark Levin handled the fourth and fifth awards. MSNBC's Chris Matthews wins the "Quote Of The Year Award" as voted on by the 2008 DisHonors Awards audience, presenters and acceptors. In place of the journalist who won each award, a conservative accepted it in jest. Those standing in for the winners: Pollster Kellyanne Conway, Ron Maxwell, director of Gods and Generals, Minuteman Project founder Jim Gilchrist, Congressman Mike Pence (R-Indiana) and Congressman Tom Tancredo (R-Colorado). The evening began with welcoming remarks from Cal Thomas, an invocation by Father John De Celles and the Pledge of Allegiance led by Major Art Finch. CNBC's Larry Kudlow presented the nominees for the"Dan Rather Memorial Award for the Stupidest Analysis." Pollster Kellyanne Conway accepted the award in jest on behalf of the McClatchey News Service. CNBC's Larry Kudlow presented the nominees for the "I'm Not a Political Genius But I Play One on TV Award." Gods and Generals director Ron Maxwell accepted the award in jest on behalf of HBO's Bill Maher. Author/columnist Ann Coulter presented the nominees for the "Damn Those Conservatives Award." Ann Coulter introduced Minuteman Project founder Jim Gilchrest who accepted the award on behalf of MSNBC's Keith Olbermann. Mark Levin presented the nominees for the "Barack Obama Gives a Thrill Up My Leg Award." Mark Levin introduces Congressman Mike Pence who Accepts Award in jest. Radio host Mark Levin presented the nominees for the "How We Adore Clinton-Gore Award." Representative Tom Tancredo accepted the award in jest on behalf of MSNBC's Chris Matthews." William F. Buckley Jr. is the intellectual cornerstone of the modern conservative movement. His founding of National Review magazine in 1955 provided the home base for conservatives in an America seemingly overrun by liberalism. 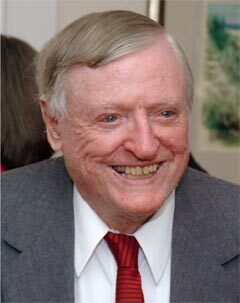 With NR, and as host of television’s Firing Line for 33 years, William F. Buckley Jr. spread the cause, helped rally conservatives during the Cold War, was instrumental in helping Ronald Reagan win the presidency — twice — and continues to provide the intellectual ammunition, along with grace and wit, to strengthen conservatives in the on-going battles to preserve liberty, peace and justice in America. Fifty-seven years ago, William F. Buckley Jr. circumvented the liberal media’s "Berlin Wall" of bias with imagination and tenacity. His intellectual progeny now populate the airwaves and cyberspace, leaving the old liberal media in the dustbin of history. To recognize and honor the very best of these new conservative leaders, the Media Research Center is proud to announce the annual William F. Buckley Jr. Award for Media Excellence. MRC President Brent Bozell announced the recipient of the William F. Buckley Jr. Award for Media Excellence. Tony Snow accepted the Buckley Award with an an optimistic speech about the greatness of America. Ann Coulter Presents funny videos from 2007 at the 2008 MRC DisHonors Awards.